Alongside its ability diminish dark spots, parsley applied topically to the skin in a face mask is also said to help reduce acne outbreaks and heal up any blemishes. Fresh lemon juice is another natural cure for dark spots and discolored skin, but it needs to be applied often for best results. Be aware though that using lemon juice on your face regularly may make it more sensitive to the sun. It can also be quite drying when used on the whole face, so it’s better to use the following lemon juice and parsley face treatment no more than twice a week. For dark spots and small areas of discolored skin, lemon juice could be applied topically twice a day, but just to the specifically affected area. Lemon juice can also be beneficial for pimples, with many people in acne forums online reporting positive results for both clearing up acne scars and reducing the frequency and severity of outbreaks. Results will of course vary from person to person though, since there are a variety of different causes of acne and everyone’s skin is different. Another problem reported with using fresh lemon juice alone is that it may sting the skin when first applied. This sensation can be reduced by adding raw honey to this parsley face mask. Raw honey (as opposed to the heat-treated commercial stuff) has skin moisturizing and soothing properties as well as being a powerful antibacterial agent. Many people find raw honey is especially good at healing up acne scars and reducing the inflammation of current pimples. Manuka honey, with its especially strong antibacterial properties, is said to be the best honey for acne treatments if you can afford it. If not, a good, unfiltered raw honey is far superior to regular store-bought honey for treating acne. 1 medium-sized head of fresh organic parsley, soaked in warm water then well chopped up. 1 teaspoon of fresh lemon juice (reduced by half if you have dry skin and perhaps exclude entirely for sensitive skin). 2 teaspoons of a unfiltered raw honey that hasn’t been heat-treated (raw Manuka honey with a high active number is the best if you can get it). Start by chopping up a branch of parsley into small pieces with a knife or kitchen scissors. Curly parsley with its darker green color may be a little better for this face mask, but the flat leaf variety is fine if that’s what you have. Crush the parsley in a mortar and pestle until it’s starting to become a paste. You can add a very small amount of lemon juice if this helps, but it’s best to just use the dampness from the soaking at the start. Mix in the raw honey and lemon juice and mash it all up well with the pestle. You can transfer it to a lighter bowl to use, but I kind of like making face masks like this up in my heavy marble mortar and using it straight from there. To apply this face mask, first cleanse your skin with a gentle, chemical-free cleanser like this one I use. Rinse and pat dry, then gently smooth the mask over your face, avoiding the eye area. I like to put extra on the nose to really get to work on any blackheads. It doesn’t matter that the crushed up parsley leaves and stalks will only be on parts of your face. As long as you’ve mashed up the parsley well and mixed the ingredients, it’s beneficial properties will be throughout the treatment. With a towel down on your pillow for any drips, lie down and relax for 10 to 15 minutes to let the treatment do it’s work. You may have some mild stinging from the lemon juice in this mixture, particularly if you currently have any acne outbreaks. This should diminish in a minute but if it gets worse or is severe from the start it would be best to wash off the face mask immediately with warm water and massage aloe vera gel into the affected area. Most people should find this facial treatment very refreshing and revitalizing for their skin. After washing it off, follow with a chemical-free moisturizer like hyaluronic acid serum. Or try using avocado oil as a face moisturizer, especially in the evening. Making up this parsley facial mask once a week is good for general skin improvement, though twice a week would be better for treating acne, dark spots and skin discoloration. Remember to avoid the delicate eye area when applying the mask, but if you would like to really clear up tired skin under the eyes and puffy eye bags then have a read of the next page on how to get rid of dark circles under the eyes with crushed parsley. Please let me know what you think of this parsley face mask if you try it. I hope it can help make an improvement in their skin for many people. Remembering back to my teenage years, I wish I’d had this recipe then. That said, skin conditions like acne usually have a deeper internal imbalance behind them. While face masks with parsley and other natural ingredients can often help treat the symptoms, to really cure skin issues like this it’s important to look at your body as a whole and investigate what in your diet or environment might be causing skin inflammation. Other natural skin treatments on Superfood Profiles include this quick and simple avocado skin mask, these homemade Ayurvedic amla treatments and this papaya facial mask with enzymes and alpha hydroxy acids. 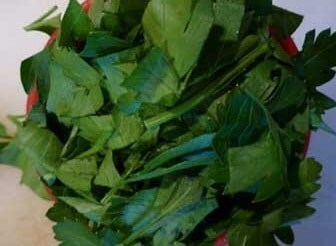 Like this parsley face mask recipe, each can be made up at home and are usually much more effective at improving your skin than commercial preparations. The whole family has great skin, Sicilian, love the sun, never a pimple or blemish but I will try the parsley cure for those ugly color patches that appear on the hands, why not we always have parsley by the pound for those meatballs and lemon is in every salad. Drink 1 8 oz glass of lemon juice daily to cleanse and detoxify. skin. With holistic treatment, it is also cheaper and affordable as you only need to change or tweak the pattern of your life style, and your diet. I agree that fresh lemon juice can have a powerful effect on treating acne. Skin treatments freshly made from natural treatments can also help with overactive sebaceous glands. You could try it but the fresh parsley would make a much better face mask I think. I use cinnamon, honey, nutmeg, and lemon juice as a mask every single night. It’s currently on as I type. It’s made my skin softer, lightened my acne scars, reduced redness, and is slowly but surely clearing up my acne. I’ve been using this for almost a week now and I’m very excited about it. Thanks for your comments. That sound like a good facemask. Much more powerful than commercial products. For anyone reading, start off with small amounts of cinnamon and nutmeg as they can sting sensitive skin. I’ve just started growing parsley to juice so I will try using it as a mask too. Cucumbers are also good for the skin, have you tried adding that to your ingredients. I intend to write about cucumbers in the future. Thanks for your comments. Usually I use these products. It gives me a better experience on skin care . Thanks for posting. Dark spot also known as hyperpigmentation in your skin. It’s true that millions of people suffering hyperpigmentation in the world. Especially females always tense about their skin and they take care their skin so much. There are a lot of clinic to take treatment of hyperpigmentation problem. But it’s can be expensive. So you can take care your skin by home remedy skin treatment. hi, just wanted to ask if lemon juice helps to cure acne and black spots on dry skin? my skin is so dry and i’ve used so many products, from acne free face wash to clove oil, conch powder. but nothing worked for my skin. I love lemon juice on my facial scrubs and masks. One home remedy I make that is gentle on my skin is the almond/ green tea scrub: organic almond flour (it’s clumpy but gentle on the skin), organic lemon juice, citric honey, organic green tea bag (break the tea bag after steeping it for 5 minutes) and mix it in with the rest of ingredients) you can toss the green tea or drink it:). The combo smells so good and so gentle on the skin. I have combination skin so I know about the dry patches on the skin. I make enough for a week and my skin loves it. My skin feels hydrated, glowing and healthy. hope it helps many. Hi Agnes and thanks for the natural skin care recipe. I hope people find it helpful too. I always take a glass of lemon juice every morning and sometimes mix it with honey. These two are blessed with great nutrients. It goes well for me. For the facial care, I have learnt a lot from this article. Thanks. Thanks very much for your website. Its insightful and very easy to understand. Just tried this face mask – love the smell whilst crushing the parsley in the mortar! I found that the mask would not really stick to my face , kept falling off. Ended up rubbing it all over my face and packing it quite thick to stay in place. Can you suggest something I’m doing wrong? Hi Kerin and thanks for your positive comments. It’s really more the potent parsley juice from the crushed leaves and stems that makes the treatment work, so as long as you’ve crushed them up well and mixed it up it shouldn’t matter whether whether the leaves stay on too much. I think rubbing it all over your face well as you did and then letting it stay on for at least 10 minutes, preferably 15 minutes or more while lying down and relaxing, is the most important part of this treatment. There are both flat leaf and curly parsley. They look quite different but have the same compounds and either will work. I would like to know if this parsly mask is good for sensitive skin? I suffer from acne and sometimes I get the cystic kind. How long before I start seeing results? Also, is manuka honey good for sensitive skin? Can we use a food processor for the parsley instead of the mortar and pestle? Yes, this is fine. You just need the parsley moist. The most natural home remedy is you can use a mixture of rose water, honey, lemon juice to form a nice pack. Apply it in the night before you sleep and fash with water in the morning.